A Texas hacienda that is the perfect choice for discriminating travelers looking for romantic getaways in Texas, a Hill Country bed and breakfast, day spa services, a girls getaway, a romantic Texas honeymoon destination or a place to relax and get a couples massage after dropping the kids off at Camp Lonehollow. Escondida is the perfect place for a long private weekend, corporate events, weddings, conferences and retreats, social gatherings, special occasions, getaways, photography sessions, and private parties. Escondida Hacienda and Spa has received the Fodor’s Travel Red Star seven consecutive years. Escondida operates on a two-night minimum. If you are looking for a single night, please call us at 888-589-7507. If we can make it happen, we will be happy to do so. Includes breakfast the following morning. Thursday, Friday & Saturday $319 with breakfast and Chef’s Choice dinner served. Dietary restrictions accommodated with one week notice. The Chef’s choice of dinner served Thursday through Saturday includes an appetizer, salad, entrée and dessert. Rates are per room per night and based on double occupancy. Additional guests are $50/night. During winter months, fireplace rooms are an additional $25/night. Rates may be higher during holidays and special events. Cancellations affect Escondida significantly due to our intimate size. Therefore we must uphold strict policies. However, guests are always welcome to send someone else in their place. Special events, packages and special offers may have different policies. Room deposits less a $50 processing fee per room, will happily be refunded if a cancellation is made prior to two (2) weeks of the date of reservation. Thereafter, no refund is possible regardless of the reason for non-arrival or early departure unless we are able to fill the reservation. Owner’s Retreat – Cancellations prior to eight (8) weeks of arrival will result in forfeiture of the deposit. Within this eight (8) week period, the guest is responsible for the full reservation, regardless of the reason for non-arrival or early departure. Escape to your own private wing of the original hacienda. You will be greeted with champagne and fresh flowers in the suite. Pamper yourselves with a ninety minute couples massage in our world class spa. On day two, enjoy a chef-prepared picnic basket. Relax in your own private paradise for the rest of the day until dinner is served. Wake up rested to breakfast delivered to your room. Start your two days in the Hill Country with a relaxing stay at Escondida Resort & Spa. Upon entering your room, you will be welcomed with beautiful flowers, a bottle of wine and the perfect pairing of cheese and fruit. Enjoy a ninety minute couples massage in our spa. In addition, you will each receive a sixty minute Escondida Signature Facial and our signature headwind massage. You will also have breakfast prepared for you each morning, along with dinner each evening. You and your loved one will be treated to our special Backroads spa package, which includes a ninety minute Swedish massage, thirty minute headwind massage, and a thirty minute body polish. Once you have relaxed in the spa, a chef prepared picnic basket will be waiting for the two of you in your room. You can take it on a beautiful hike, find the perfect spot on the property or just enjoy each other in your room. This package also includes chef prepared breakfast and dinner each morning and evening. Start off your visit by treating that special someone in your life to two relaxing days and nights at The Spa at Escondida. Upon arrival, you will find a complimentary bottle of wine and chocolates in your room for your enjoyment. Breakfast is prepared each morning and dinner served each evening. You and your special someone will also have the opportunity to be pampered in our world class spa with an Escondida Signature Facial and headwind massage. Then each of you will receive an hour Swedish massage. It all begins on Wednesday with the Chef’s choice of dinner. Thursday morning we will serve a light breakfast with complimentary champagne. Then around 2:00 Thanksgiving Day dinner will be served and we make a lot of EVERYTHING. After football or a nap Thursday afternoon, we set out the leftovers just like at home. Breakfast is served on Friday morning. 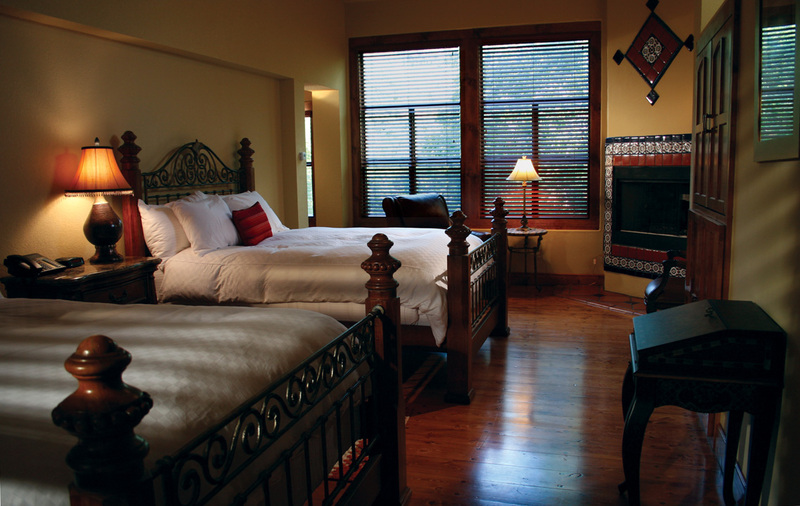 Escape all the hustle and bustle and relax in a spacious room in the Texas Hill Country. Upon your arrival, you will be welcomed with fresh flowers, chocolates and a complimentary bottle of champagne on ice. This package also includes two 60 minute Swedish massages or one 120 minute Swedish massage.